When Scott Gorham’s new version of Thin Lizzy decided on writing new material for a record, there was a pretty big opposition within the Lizzy fans’ camp. Understandably so because Scott had always ensured that the Thin Lizzy that were out playing gigs – the band that featured Ricky Warwick (ex The Almighty) on lead vocals and rhythm guitar Scott and Damon Johnson (ex Brother Cane) on lead guitars, Marco Mendoza (ex Whitesnake) on bass, keyboard player Darren Wharton (Thin Lizzy, Dare) and former Thin Lizzy drummer Brian Downey – were nothing more than a band paying tribute to the Lizzy that he and Downey once played in, giving their large fan base a chance to hear those classics live. So when the band went in to the studio to record, not everyone were pleased. The first thing that happened was that both Downey and Wharton jumped the ship, due to lack of interest in forming a new version of Thin Lizzy. Wharton wasn’t replaced at all and Jimmy DeGrasso (ex Y&T, White Lion, Megadeth, Suicidal Tendencies) replaced Downey. But in mid recording the guys decided on that Thin Lizzy wasn’t a good name for the band when new music was about to be released. It’s ok to tour as Lizzy and play the classics live, but not to release new music under that name. No Philip Lynott, no Thin Lizzy. The band released their debut album, the brilliant All Hell Breaks Loose (2013), under the new name Black Star Riders and started touring. I saw them live on a couple of occasions and just like they did when they played as Thin Lizzy, they delivered the goods every time I saw them. It was also clear that the new songs stood up well beside the old classics, even though it’s really hard to compare them to each is other. After a success like their debut, the band had some big pressure on their shoulders to come up with an album at least just as good, but hopefully one even better. A change in the line-up had also taken place before the recording. Bass player Marco Mendoza left the band to fully concentrate on his other band The Dead Daisies and was replaced by Robbie Crane (ex Ratt, Vince Neil, Adler’s Appetite, Lynch Mob). The title track opens the album and it sets the standard right away. With a big Lizzy vibe, this great rocker is everything I had hoped for. Brilliant opener! “Bullet Blues” follows and it takes us back to 1976 and Jailbreak, a heavy rocker that has a big potential in being a future live favourite. First single, “Finest Hour” is brilliant. It has a big pop feel and its catchiness makes this a hit – it really should be one, anyway. Let’s hope for some air play for this one. “Soldierstown” continues in a heavier way where last album’s “Kingdom Of The Lost” left off. It’s a groovy pop rocker with a celtic vibe – think “Emerald” – that Thin Lizzy used to be so good at – awesome! “Blindsided” is another track that has a big hit feel all over it. It’s a ballad on an acoustic foundation that turns into an electric and pretty heavy rocker towards the end – brilliant! On “Turn In Your Arms”, a very Lizzy-like rocker, they bring back the twin lead guitar sound that Lizzy made famous and Gorham and Johnson work really well together. The album ends with “You Little Liar”, a seven and a half minute rocker that ends with a long jam – very cool, energetic, real and passionate. Not all jams end well, but these guys sure knows how to do it. If you get the deluxe edition – which I’d strongly advise you to – you’ll get not only acoustic versions of the title track, “Blindsided”, “Charlie, Please Don’t Go” and “Finest Hour”, but also two completely new songs. “Gabrielle” is a rough, acoustic little tune that at first feels like a throwaway bagatelle, but it grows on you very fast and then there is “The Reckoning Day”, a brilliant groover that rocks hard and that one is a track that you can’t do without. It actually bums me out that it’s not in the original track list, but I guess they need a selling point – “The Reckoning Day” is that selling point. 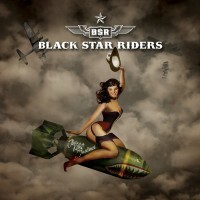 Just like the debut, Black Star Riders’ new album is a grower, but also like the debut, this really hit home with me right away – and it just gets better and better. It’s very much a sister album to the debut but this album is made by a band that – except for Crane – has played together for years now and you can hear that they have gotten to know each other for real now and it makes the result much tighter. The Thin Lizzy vibes are there, obviously, Gorham’s influence is bound to rub off on most things and when the rest of the band are big Lizzy fans, then how can it not? But whereas the debut was made very much with Thin Lizzy in mind, this album is a band finding their own sound and they successfully manages to do so as the Lizzy influences are fewer and when they do show up, they are not as obvious, at least not on most songs. They change from Mendoza to Crane passes more or less unnoticed – Crane is a great bass player that always delivers, but it’s not like he’s a player like Billy Sheehan or Steve Harris that takes over the sound completely. Also, Ricky Warwick’s Phil Lynott influence from the debut has taken a step back and even though it’s still there, Warwick comes across as himself lots more here – and that is only a good thing. After the great debut and the brilliant follow-up, Black Star Riders’ biggest problem now is how to follow up this one with an even better effort next time. Me, I can hardly wait for that to happen.